A band of lawmakers thinks share buybacks are too good to last. Last year, companies bought back a record $806 billion in shares of their own stock. But the high volume stirred controversy. Republican Senator Marco Rubio joined Democrats including Chuck Schumer and Bernie Sanders in decrying share buybacks. 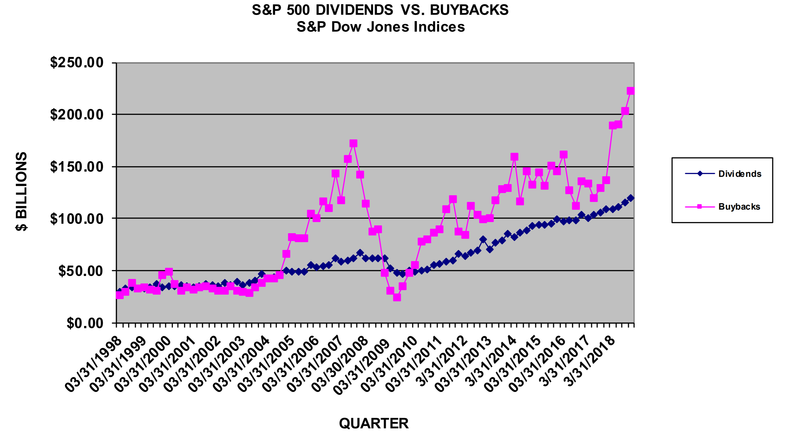 This attack on buybacks is politicians’ feeble attempt to take more money from investors’ wallets. President Donald Trump signed a tax cut in 2017. Many saw the move as pro-business because it adjusted the corporate tax rate from 35% to 21%. In the year that followed, corporations found that share buybacks were a good way to return value to shareholders. This week, the S&P Dow Jones Indexes announced that 2018 was a record year for buybacks. The fourth quarter marked the year’s peak with a total of $223 billion. The chart below shows the trends in dividend yield and share buybacks of the S&P 500. Investors who only look for a dividend yield are missing a huge opportunity with buybacks. Simply put, share buybacks are when a corporation buys back its own shares — cutting the total share count. That means the remaining shares out now represent a bigger piece of the company. They return value to shareholders through a tax-efficient yield. They boost earnings per share (EPS) by cutting the total share count. Unlike a dividend, which is taxed based on income, the yield from share buybacks is seamlessly rolled into capital gains. Shares held for a year or longer are taxed 20% or less. Dividends are considered income and, in most cases, are taxed higher than capital gains. The real yield from share buybacks is even higher than dividends after this tax effect. But savvy investors aren’t the only ones who benefit from buybacks. Some management teams are compensated based on EPS. Pulling shares off the market is a good way to cut share count and boost EPS. A long-held favorite of income investors are known as the Dividend Aristocrats. This group of stocks earned its regal title by growing dividends for at least 25 years. But with the growing popularity of buybacks, we need a new way to think about yield. We can find the total yield by combining the dividend yield with the amount of buybacks. Last year, the S&P 500’s dividend yield was just 2.17%. In contrast, its yield including buybacks was 6%. Utilities only yielded a total of 3.61% in comparison. The information technology sector spent the most on buybacks. Income investors dislike this sector for its below-market dividend yield of 1.55%, but the combined yield was a market-topping 6.83%! That’s thanks to $278.5 billion spent on buybacks. This “hidden” yield has major tax advantages. Assuming a long-term capital gains rate of 20%, Washington, D.C. would collect $161.2 billion from last year’s buybacks. If that cash was returned in the form of dividends, the tax bill would be as high as $298.2 billion! It’s no wonder career politicians are trying to tax buybacks as dividends. Investors looking to profit from this trend can consider companies with a track record of passing on value through buybacks. The three companies with the largest buyback budgets last year were Apple (Nasdaq: AAPL), Oracle (NYSE: ORCL) and Wells Fargo (NYSE: WFC). Investors looking for a passive approach to holding the best overall yielding companies should consider exchange-traded funds (ETFs) such as the Cambria Shareholder Yield ETF (BATS: SYLD) or the iShares US Dividend and Buyback ETF (BATS: DIVB). Both ETFs trade on the BATS, aka the CBOE BZX U.S. Equities Exchange. For our purposes, trading a stock listed on the BATS is the same as if it were listed on the NYSE. These funds track a basket of companies committed to returning value to shareholders through buybacks and dividends.